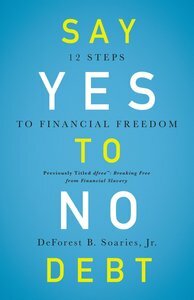 Drawing on his personal experience and years as a pastor, public policy maker, and community leader, DeForest "Buster" Soaries, Jr. shares the twelve steps to achieving financial freedom in this groundbreaking, life-changing book-Say Yes to No Debt. "The idea that debt is actually slavery is offensive to all of our sensibilities," says Soaries, "but when we continue to spend what we don't have, charge what we don't need, and borrow more than we can repay, then we must call the problem what it is: slavery. Eliminating debt is the first step toward financial freedom. And we can do it." Here, Soaries shares the twelve steps to financial freedom that have helped families in hundreds of churches. By replacing the "get more money" mentality with a "get out of debt" approach to financial freedom, not only were thousands of people able to become debt free, church's that have used the dfree® strategy have experienced increased giving by their members. Says Soaries: "There may be no greater need than to understand that debt-free living is the first step toward financial freedom. And the result is that we can enjoy life and leave a real legacy for our children." About "Say Yes to No Debt"
Customer Reviews For "Say Yes to No Debt"
I've read quite a few books on this topic and this one stands out among the best. It's practical and methodical, with no airy-fairy promises except for commitment, hard work and sacrifice. The practical helps were very easy to understand and implement.